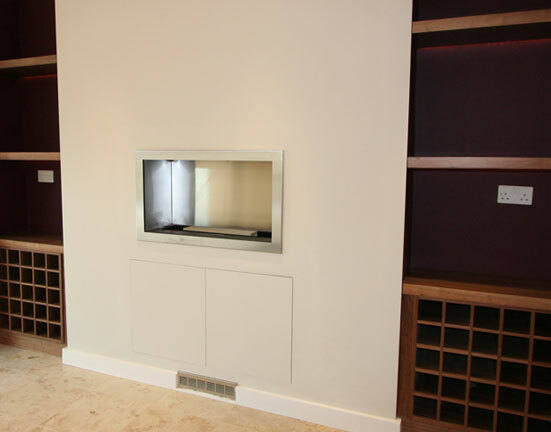 The alcove shelving and wine rack units were made from walnut veneer with solid edging and under-shelf lighting detail. The media unit with sliding doors was made from spray-lacquered MDF with stainless steel inlays. The bed was made with high-gloss spray-lacquered MDF and also featured a leather-panelled headboard with lighting detail around. The cupboards were made from walnut veneer, while the lobby cabinets featured Shaker style doors and a glass display cabinet in the centre, which was made from spray-lacquered MDF. The double doors with a glazed, semi-circled window were made from pine and the wardrobe was also made from walnut veneer. The master bathroom has a limestone floor, wall tiles with under-floor heating and niche shelving in the shower. The vanity unit was made with veneered walnut doors with a limestone worktop. In the main bathroom we used ceramic tiles, gave it a teak floor with steps to the bath as well as a spray-lacquered MDF vanity unit. The guest bathroom was also fitted with ceramic tiles, niche shelving in the shower, and a slate bench and vanity top. The cloakroom has a walnut-veneered sink unit with solid edging and a limestone floor.